A brand is embodied and built by experiences. And who creates those experiences? Your employees, staff and representatives. The people who interact with your target audiences are the ones who will bring your brand to life and support its integrity. Your people are your best marketing tools! Introduce a brand they’re proud of. 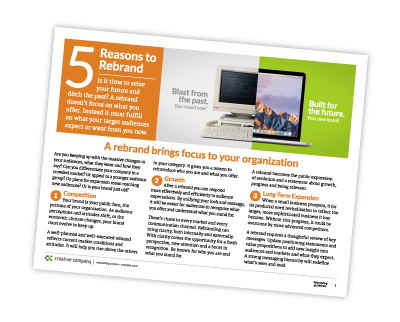 So many times leadership will look at rebranding as creating a new logo and a new set of graphic standards for communications — from print to online. Yes, that’s important because it creates visual consistency and can reinforce essential messages and ideas, but that’s focused primarily on the external audiences. How do those brand ideas and visual standards actually work in the day-to-day world of communications? With a staff brand program, tools and training are provided to simplify day-to-day communications and maintain the brand standards. With an internal brand program, key staff people are trained to become brand champions. They are taught to use the tools provided, and immersed in the importance of consistency, the elements of the brand and its focus. They are trained to understand the ideas and values behind the brand’s day-to-day use. We live in a visual society. People glance and scan instead of read. First impressions become the only impression. With this chaos of messages, images, online and offline communications surrounding all of us 24/7, your audiences are constantly overwhelmed. That’s why those visual cues–the basic brand elements of colors, fonts and overall style–must be maintained in even the simplest of internal and external communications: a letter, fax, email or PowerPoint presentation. When it works, the brand, at a glance, connects the viewer to your organization. It represents your values and purpose. When visual elements are out of sync, they damage how the brand is perceived. Value shrinks. When a distinctive and unique brand design embodies the culture and values, everyone loves showing off their new business cards. After all, who wants a boring business card? We’ve seen over-the-top excitement with a new brand identity system that truly represents the organization. It’s more than great design. It’s design and visuals that speak to those who live the brand. That embody what they stand for and strive for. That gives them clarity about who the organization is and its place in their industry. It’s being recognized. Build the visual and verbal brand–visuals supported by messaging that resonates with internal and external audiences. These links give you a few examples of how an internal brand program will add power to your marketing. When you bring your brand to life for your team, you’ll elevate perceived value with external audiences. 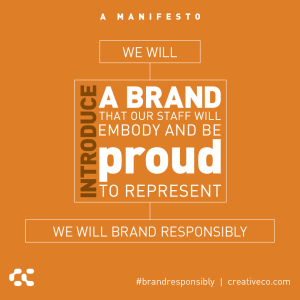 Help your staff live the brand with an integrated staff brand program, built on the ideas and values that make your organization hum. What has been your experience with internal branding? Do you have any success stories you would like to share about your internal brand program? 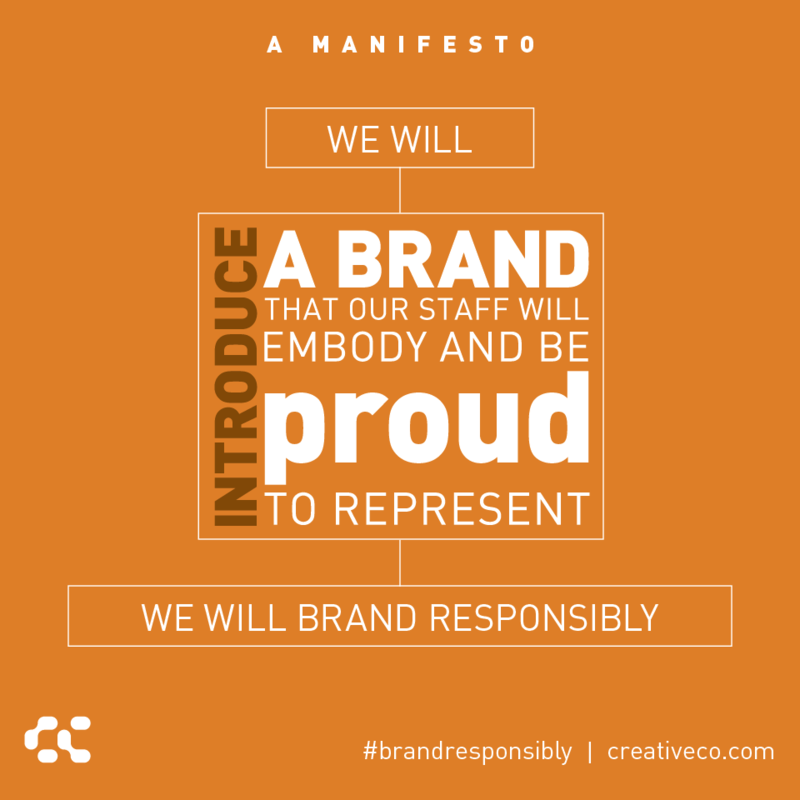 Download your copy of our Brand Responsibly Manifesto poster … share it, post it, be responsible!